Binary (IOM) Ltd. and Binary (Europe) Ltd. Regulated by Malta Gaming Authority, license no. MGA/CL2/118/2000. Regulated by Gambling Supervision Commission in the Isle of Man and by UK Gambling Commission. Several types of charts with indicators, including HighCharts and TradingView Charts, self exclusion (set limits on your own trading activities), pricing tables, flexible expiry times, early close. Best Fixed-Odds Firm 2012 at Global Banking & Finance Review Awards. BetOnMarkets has also been awarded the 2010 Trade2Win Members' Choice Silver Award for Best Fixed Odds Broker. Binary.com is the new, rebranded version of BetOnMarkets.com. Their products and services are much the same, but their website has been revamped and improved. If you are not familiar with BetOnMarkets, they are one of the oldest binary options brokers operating online. They first started offering their services in 2000, and they won Best Fixed-Odds Firm 2012 from Global Banking and Finance. They do not accept USA traders, unfortunately, but they do cater to customers around the world. To all appearances, they have many more features and a lot more to offer a casual or serious trader than the majority of binary options sites. One of the things which is impressive about Binary.com is their transparency. It is easy to find out about the company and check up on their background. When you scroll to the bottom of their site, you will immediately see information about the companies that run the site, Binary (IOM) Ltd. and Binary (Europe) Ltd. You will see that they have offices in the Isle of Man and in Malta, and are regulated by two different gambling commissions: the Gambling Supervision commission in the Isle of Man, the UK Gambling Commission, and the Malta Gaming Authority in the rest of Europe. The license number is listed, and there are links to all three authorities’ websites so you can look up more details. Binary.com charges no fees for depositing or withdrawing, and has no minimum thresholds set, which makes them incredibly flexible and reasonable. There are numerous different ways you can deposit money, including credit or debit card, bank transfer, Western Union, and a number of e-wallet services. Additionally, Bitcoin and Litecoin deposits and withdrawals are supported. You may keep an account in US dollar, Great Britain pound, euro, Australian dollar, BTC, or LTC. You have the option of opening up a real account or a virtual account. With this demo account, you can practice indefinitely, and only trade with real money when you are ready. The majority of binary options sites cater to traders with very small accounts and casual trading interests—and intraday trading only. Binary.com lets you deposit as little as $5, but also allows you to have hundreds of thousands of dollars in your account. Trades start as small as $5, and you can trade $30,000 a day if you want without authenticating your account. After you authenticate, you may trade $350,000 a day. So whether you have a tiny account or a very large one, you can conduct business on this site. Additionally, you will find a much wider range of expiry times. The usual trades lasting a few minutes to a few hours are offered. Trades can also last days, weeks, or months—up to a year. So if you are into position trading, you can actually participate in the market. On other websites, there is no way for a long-term trader to make money. In addition to long-term binary option contracts, Binary.com also offers tick-based expiries – so you can trade extremely short-term options trying to predict the next tick’s movement. There are 173 assets, including stocks, indices, currencies, commodities, sectors, and randoms. That makes it one of the largest selections we have ever seen. Trade types include Rise/Fall (your standard High/Low trade type), One Touch, No Touch, Higher/Lower (similar to One Touch), Tick Trades, In/Out (the same as Range trading), Call/Put Spread, High/Low Ticks, Lookbacks, Reset Call/Put, and Asian contracts. Payouts of up to 1000% are available on some trade types. Additionally, exotic types of binary options are available – for example, Reset Call and Reset Put that enable you to win normal call/put contracts when the price reverses after going into your direction. Educational materials on the site include a glossary, FAQ, and a large number of basic how-to pages. Trading tools include pricing tables, early close, several different types of charts which include indicators, and a special “self exclusion” option which allows you to set limits on your own trading activities to mitigate risk (or deal with a gambling problem). On a related note, the site includes a section on Responsible Trading and links out directly to GamCare, a support organization for people with problematic gambling behavior. Once again, this is a unique level of transparency. On October 5, 2016, Binary.com announced the launch of MetaTrader 5 platform support. With MT5, you can trade volatility indexes, analyze charts using cutting edge indicators and drawing tools, use automated experts advisors for hands-free trading. Volatility indexes are available for trading every day of the week, 24 hours a day, so you can trade them anytime. Currently, other trading instruments are considered for addition to MT5 platform. For now, the platform is available only to customers from outside the European Union and Australia. On July 4, 2018, Binary.com launched its new web-based trading platform – Ladders. It is a simplified trading interface that works in your browser and lets you trade basic binary options (call and put) while being able to do a quick technical analysis in a live chart. One significant advantage of the Ladders platform is that call and puts resolve in your favor when the option expire at-the-money. E.g., if you buy a call for EUR/USD with a strike price of 1.1515, it will become profitable even if the expiration rate for the currency pair is exactly 1.1515. As great as all of these features are, Binary.com is not without a couple of drawbacks. Sadly, the live chat was not available, even though we checked on a Monday. The site specifically says that live help is available 24 hours a day, Monday-Friday. After waiting just five minutes, the page redirected us to send an email using the web form instead. So that was somewhat disappointing. It may be an issue tied to the new website, but considering there were no errors anywhere else on the site, it seems more likely to be a problem with customer service. The other red flag which makes it impossible to give a completely solid recommendation were some of the customer reviews we found on third-party websites. There were a number of people complaining about lack of communication, particularly concerning withdrawals. Others complained about the odds being tipped against them, but this is typical of the binary options world and doesn’t necessarily reflect on the broker. Given the lack of customer service when we visited the site, though, the other complaints seem worth considering. Despite the complaints (which were far from universal), there is no denying that Binary.com is a thorough, well-developed website with a wealth of great features. The unlimited demo account, exciting trade types, broad range of assets and expiry times, high trading limits, and charts are all standout features that you are not going to find at your average binary options broker site. The transparent, clear information about the company at the bottom of the page stands as a sign of good faith, and the fact that they are regulated gives you some assurance about your business with them. The fact that they also persuade customers with gambling addiction problems to put limits on their own activities and seek help is another positive sign of the company’s good intentions. The proprietary platform that Binary.com operates allows them to offer more. They are definitely worth closer investigation, and may very well be worth opening a demo account with, if you are in a country where they operate. Be sure to get in touch with customer service before you deposit money so that you can evaluate their team for yourself. That is really easy to do. Just go to their homepage and fill in the short form in the top-right corner of the screen. It’s in orange color – can’t miss it. 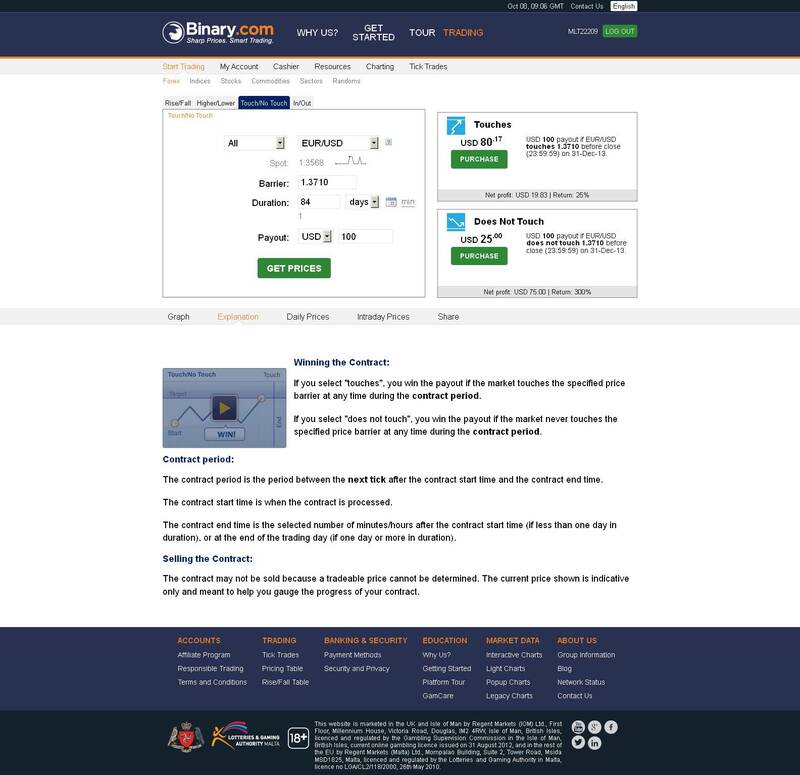 The platform binary.com uses is a proprietary one but it is fascinating to realize that the features they offer are not really similar to what you can regularly see from binary option brokers. The classic trading elements are still there like the amount, the asset/s you want to trade and expiry time, there are still many trading add-ons, and the add-ons will help you gain more profit, isn’t that good? website yang banyak dilihat oleh orang-orang indonesia. diperkirakan jumlah pengunjung dari indonesia per maret 2015 adalah sebesar 400 ribu orang. teman saya sendiri sudah masuk. dan hasilnya ok punya. I rate them 9 star because their service is reliable. Deposit and withrawal are done with ease and safe. I have been trading with this company for about 6 years or more now, Till date, there has never been a problem. One more very exceptionell feature of Binary.com, which I have not seen by any other broker, is that you can set also a pending order – for any expiry time (not in seconds!). Demo -account is totally free – you need not deposit any money to get one. With their another speciality the Random Indices you can practice trading (or trade with real money) also in weekends. I have had no troubles communicating with their customer service. All email questions have been answered in a couple of hours. If there has been any urgency I have called the support. 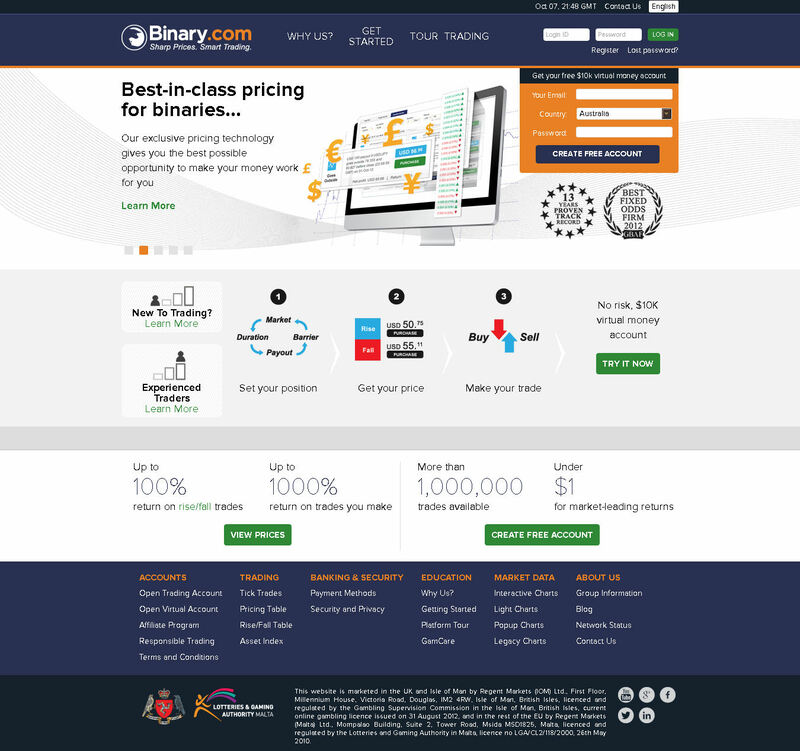 Binary.com really is in its own category as a binary option broker. I am in Kenya and very green. Can I trade with you binary options? I just reformat my notebook, and I need to get the platform to be installed again. However binary.com is no more accessable from the Indonesian internet, it is blocked by the goverment policy/rule. Most possibly it is being catagorized as gambling website. How to overcome this, so I can re-install the platform again? I recommend using VPN for this – for example, KeepSolid or any other quality and secure one.